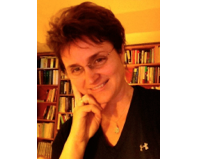 Zsuzsanna Fagyal is an EUC-affiliated faculty member. This article was originally posted in the Spring 2014 School of Literatures, Cultures, and Linguistics Newsletter. “I almost fainted!” she remembers, laughing. As it turned out, 62 students had shown up on the first day of classes, interested in the content. That was in 2011. Today, “considerable” is how she describes interest in the course, which Fagyal, an associate professor of French, and Professor Doug Kibbee started at the U of I seven years ago. The course marked the first time an academic department (French) and the European Union Center (EUC) joined forces for course development. According to Fagyal, the course was based “on Doug’s vision,” primarily as a language policy class. She contributed by making it relevant for socio-linguists, developing it as an EU survey course while Kibbee in turn became the first director of the School of Literatures, Cultures and Linguistics. The course initially focused on France, Germany, and multilingualism in the European Union. Fagyal, who has a degree in linguistics (PhD), Romance and Slavic philology (MA), and a graduate minor in EU studies, was soon struck by how many different regions could be encompassed within this course, including regions of Spain, Italy, the Baltic countries, and Eastern Europe. In addition, there are the Scandinavian countries and the regions that formerly comprised Yugoslavia. The focus, however, has always remained the European Union. To make enrollment manageable, the course is now capped at 35 students. With its number designation of 418, it is offered to undergraduates and graduates for 3 or 4 credits, respectively, in seven different programs and departments. Currently being taught by Fagyal during the 2014 spring semester, the plan is for Fagyal and Eda Derhemi, a lecturer in the Department of Spanish, Italian, and Portuguese, to alternate teaching the course each year. Derhemi became involved in this project in 2012 and co-taught the course in 2013. She graduated in linguistics and literature at the University of Tirana, Albania. She received an MA in linguistics and a PhD in communication from the University of Illinois. She has previously worked for UNESCO and also as a correspondent for Deutsche Welle. She is a regular writer of opinion pieces in the main Albanian media. Derhemi and Fagyal currently have a related text that was just accepted for publication by Multilingual Matters. Titled Languages and Minorities in Europe: An Introduction, it is intended as a print and e-textbook, with an accompanying website. It will be published in 2015. With the success of the 418 course, “Language and Minorities in Europe,” Fagyal and Derhemi have joined with Marina Terkourafi, associate professor of linguistics, to develop a new SLCL course, “Languages and Cultures of the Mediterranean.” The trio received support from SLCL in addition to one of the five EUC Research and Course Development Grants for the development of this new course. EUC grants support proposals pursuing contemporary European Union topics that meet the highest standards of excellence and contribute significantly to the advancement of EU studies and the center’s academic programs at the U of I. Like 418, “Languages and Cultures of the Mediterranean” will be a lecture-based class focusing on the present while encompassing the necessary amount of history for students’ overall level of understanding. Students also write a language blog, one of many reasons why the course is so popular, as students can instantly react to or comment on current events concerning language across disparate areas in Europe. Some of the comments written in earlier years have received comments from the general public and language activists in Europe. These blogs can be viewed on the EUC homepage at euc.illinois.edu. Finally, students will conclude the class by writing a critical paper of their choice, done after completing extensive readings throughout the 15-week semester. Together, Fagyal, her students, and her teaching associates are on a journey that continues to change and grow, and provide new avenues for learning along the way. Will YOU Be the Welsh Learner of the Year?